VisualVM is a free monitoring tool for the JVM. It is much more feature rich than Jconsole. It comes built in on the Oracle JDKs. 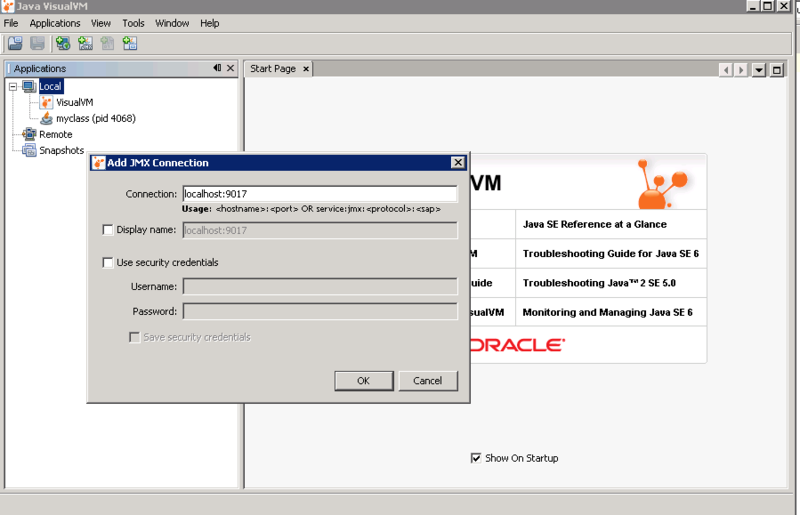 You can also download a standalone version from visualvm.java.net. The tool ‘jvisualvm’ is located in bin directory under ‘JDK Home’. Note, similar to jconsole, if you are running visualvm with the same user id as the application, the application will appear under ‘Local’ and you can begin monitoring right away. However, if that is notthe case, you must first enable JMX remote management by adding the following parameters to the Java command line. How to invoke Jconsole ? So you enabled verbose GC logs and obtained the logs. Congratulations. You have done one of the most important steps in troubleshooting JVM memory issues. But merely having the log does not do any good. You need to analyze and determine if there is a smoking gun. Here is how to do it. 1. First make sure you collect the logs for at least few hours. Longer the better. 2. Open the log file in a text editor. a. Is the GC happening very frequently? b. Is each GC cycle taking long time? If you have to choose only one tool to troubleshoot Java memory related issues, you must choose the ‘verbose gc logs’. Verbose GC log has so much information that you can diagnose almost all types of memory issues just by carefully reviewing the data in this file. It is such a valuable tool. What’s more? The load exerted on the JVM due to verbose GC logging is virtually nothing. So, don’t skimp on enabling verbose gc logs when you need to. What exactly do the verbose GC logs reveal? If you think you will never run into out of Memory error because your code is leak proof and your application server is rock solid, think again. Your application can run out of what eludes most developers and Systems Administrators – Native memory. To put it blunt, Native memory is the memory used by JVM itself for its internal low-level tasks (for example file handles) and the memory used by any native code (such as a C library within the JVM). What are the symptoms of native memory issues? a. java.lang.OutOfMemoryError:Detail Message: request <size> bytes for <reason>. Out of swap space? Note that the errors above are for Oracle HotSpot. The error varies by the JVM vendor. What causes native memory issue? 1. Application code issue where fault code creates tons of low level elements (such as File handles,network sockets etc). How to prevent native memory issue? There is not a lot you can do to prevent a native memory issue as these issues are totally unexpected. 2. Ensure the application code does not leave lingering network or file handles. One useful way to determine if you have native memory issue is to check the ‘process size’ of the JVM viewed using operation system tools (for example ‘top’ in Unix). This process size will include Heap and native memory used. OutOfMemory error can occur due to fragmented heap. This issue is not as common as the heap exhaustion but it is a deadly issue regardless. What are the symptoms of Heap Fragmentation ? What causes Heap Fragmentation ? When your application has used up the entire allocated heap (-Xmx) and still needs more, you run into the classic OutOfMemory error. There is simply no more memory available for your application. What are the symptoms for Heap Exhaustion? GC algorithms/collectors define how GC is expected to behave at run time. There are various Collectors that you can use depending on your need. Note that the collectors vary greatly by the implementation of the JVM. This document addresses Oracle Hotspot JVM. Simplest. It uses just one thread to perform the GC operation. So, it is suited for single processor machines (are there any still left ?). As your application runs, the new objects are created in young generation. When the young generation is about to fill up, GC runs what is known as a ‘minor‘ collection and reclaims memory from unused objects in young generation. While at it, the minor collection also moves ‘long lived’ objects to ‘old’ generation. A ‘major‘ collection (a.k.a Full GC), which is invoked when there is serious unmet demand for memory, sweeps through the entire heap to reclaim memory.